Scientists are the first to track the gravitational waves emitted by a merger of two black holes using three different detectors—a critical new capability that lets scientists more closely locate a gravitational wave’s birthplace in space. 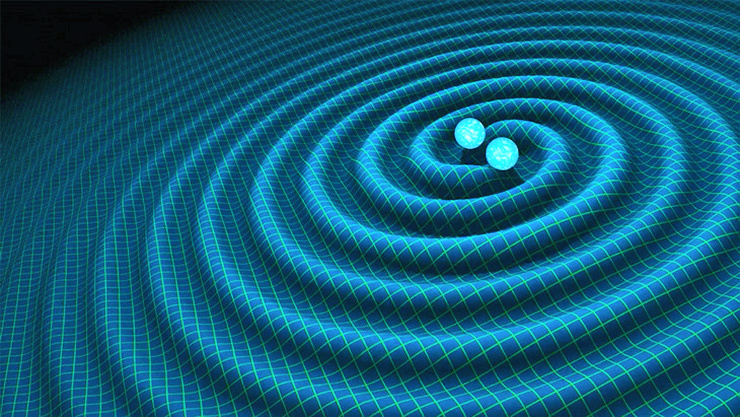 Gravitational waves are ripples in space and time created when two massive, compact objects such as black holes merge. A paper about the new gravitational wave—known as GW170814—has been accepted for publication in the journal Physical Review Letters. The LIGO Scientific Collaboration’s two gravitational-wave detectors in the United States and the Virgo Gravitational-Wave Observatory in Italy made the new detections on August 14. It is their first joint detection of gravitational waves. It also is the fourth announced detection of a binary black-hole system and the first significant gravitational-wave signal recorded by the Virgo detector. The detection is especially important because it highlights the scientific potential of a three-detector network of gravitational-wave detectors. “It is our hope to one day detect gravitational waves and to simultaneously observe the source of the gravitational waves with conventional telescopes so that we might learn even more about what causes the gravitational waves. In order to do that, we need to know where to look,” says Chad Hanna, assistant professor of physics and of astronomy & astrophysics at Penn State, who has served as co-chair of LIGO’s Compact Binary Coalescence Group, which has detected all the gravitational waves discovered thus far. “LIGO and Virgo together allow us to pinpoint the gravitational wave source in the sky far better than before, which will dramatically improve our chances of capturing the gravitational wave source with other telescopes,” he explains. The new ability to observe gravitational waves with three detectors—two at LIGO plus one at Virgo—opens the door to additional scientific knowledge. “Thanks to Virgo we can now test a key prediction of Einstein’s general relativity, namely the polarization property of the wave,” says B.S. Sathyaprakash, professor of physics and professor of astronomy and astrophysics at Penn State. “The two LIGO detectors alone are not able to infer the polarization property of gravitational waves because they alone could not fix the position of the source in the sky. The addition of Virgo as a third detector helps in localizing the source and hence allows us to infer the wave’s polarization. As far as we can tell, Einstein is still right,” he says. The NSF funds LIGO, which Caltech and MIT conceived, built, and operate. Germany (Max Planck Society), the UK (Science and Technology Facilities Council), and Australia (Australian Research Council) also provided financial support for the Advanced LIGO project. The Virgo detector, located near Pisa, Italy, involves physicists and engineers from 20 European research groups. The National Science Foundation and the Charles E. Kaufman Foundation of The Pittsburgh Foundation support Chad Hanna’s work. The National Science Foundation and the Indo-US Science and Technology Forum support B.S. Sathyaprakash’s work.